NASHE SLOVO was to settle accounts with Kautsky too. On the eve of the imperialist war his international reputation still stood very high though no longer at the height it had reached at the beginning of the century and particularly during the first Russian revolution. Kautsky was without doubt the most outstanding theoretician of the Second International and over the major part of his conscious life he represented and generalized the better sides of the Second International. Kautsky the propagandist and vulgarizer of Marxism saw his principal theoretical mission in reconciling reform and revolution. But he himself took shape ideologically in an epoch of reform. For him reform was the reality. Revolution was a theoretical generalization and a historical perspective. Darwin’s theory of the origin of species embraces the development of the vegetable and animal kingdoms in its entirety. The struggle for existence and natural and genetic selection proceeds unceasingly and without interruption. But if an observer were to have sufficient time at his disposal for making observations—say a millennium as the smallest unit of measurement—he would doubtless establish before his eyes that there are long epochs of a relative equilibrium of life when the workings of the laws of selection are almost imperceptible and the species preserve their relative stability and appear to be an embodiment of platonic ideal types. But there are also epochs when the equilibrium between the animal, vegetable and geographical factors is upset, epochs of geo-biological crises when the laws of natural selection assert themselves with all their fierceness and lead the development over the corpses of vegetable and animal species. In this gigantic perspective Darwin’s theory stands before us above all as the theory of critical epochs in the development of the vegetable and animal world. Marx’s theory of the historical process embraces the entire history of socially organized man. But in epochs of relative social equilibrium the dependence of ideas on class interests and the system of property remains masked. The high school of Marxism is formed by the epochs of revolution when the struggle of classes which arises from the system of property takes on the character of open civil war and when the systems of state, law and philosophy are stripped bare as subsidiary organs of classes. The theory of Marxism itself was formulated in a pre-revolutionary epoch when the classes were seeking a new orientation and finally took shape amid the experiences of the revolution and counter-revolution in 1848 and the years following. Kautsky did not have this indispensable living experience of revolution. He received Marxism as a finished system and popularized it like the schoolmaster of scientific socialism. The flowering of his activity came about in the deep gulf between the routed Paris Commune and the first Russian revolution. Capitalism had developed with an omnipotent might. Workers’ organizations grew almost automatically but the “final goal”, that is the social-revolutionary task of the proletariat, became separated from the movement itself and maintained a purely academic existence. Hence Bernstein’s notorious aphorism: “the movement is everything the final goal, nothing”. As the philosophy of a workers’ party this is nonsense and banal. But as a reflection of the real spirit of German social-democracy of the last quarter-century before the war Bernstein’s dictum is very indicative; the everyday reformist struggle had acquired a self-sufficient character while the final goal was kept in Kautsky’s department. Kautsky tirelessly defended the revolutionary character of the doctrine of Marx and Engels although even here the initiative in rebutting the attempts of the revisionists belonged usually not to him but to the more decisive elements (Rosa Luxemburg, Plekhanov and Parvus). But politically Kautsky had totally reconciled himself with social-democracy as it had developed, did not notice its deeply opportunist character and did not respond positively to the attempts to give a firmer character to the party’s tactics. The party—that is, its ruling bureaucracy—had too for its part reconciled itself to Kautsky’s theoretical radicalism. This combination of practical opportunism and principled revolutionary ideology found its highest expression in the brilliant turner, August Bebel, undisputed party leader over nearly half a century. 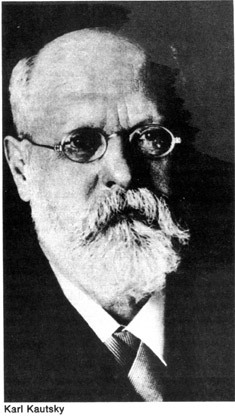 Bebel gave his support to Kautsky in the field of theory while himself being for Kautsky the final arbiter on questions of policy. Only Luxemburg could at times nudge Kautsky further to the left than Bebel wanted. German social-democracy occupied the leading place in the Second International. Kautsky was its acknowledged theoretician and it seemed, its inspirer. From the fight against Bernstein Kautsky emerged the victor. French socialist ministerialism (“Millerandism”) was condemned at the Amsterdam Congress in 1904 where Kautsky’s motion was adopted. In this way Kautsky seemed to have become the acknowledged theoretical legislator of international socialism. This was the period of his greatest influence. His enemies and adversaries used to call him the “pope” of the International. Frequently too his friends glorified him in this way, though with affection. I recall how old mother Kautsky, a writer of tendentious novels which she dedicated to “my son and my teacher” on her 70th birthday received greetings from the Italian socialists addressed “alla mamma del papa” (to the pope’s mother). The 1905 revolution broke out. It at once strengthened the radical tendencies within the international workers’ movement and reinforced Kautsky’s theoretical authority immeasurably. On the international questions of the revolution he took up (to be sure, later than some others) a firm position and foresaw a revolutionary social-democratic government in Russia. Bebel would chuckle in private: “Karl is quite carried away” and smile from the corner of his thin mouth. In the German party it became reduced to a discussion on the General Strike and a radical resolution. This was Kautsky’s zenith. Thereafter he entered a decline. I first saw Kautsky in 1907 after my escape from Siberia. The defeat of the revolution was not yet evident. In this period Luxemburg’s influence on Kautsky was very great. For all the factions of Russian social-democracy his authority was beyond dispute. It was not without trepidation that I went up the steps of the neat little house in Friedenau just outside Berlin. An “other-worldly” impression of a little greying old man with bright eyes saying in Russian “How do you do?” taken together with the impression formed from his scientific works from which we had all learnt so much, went to make up a highly attractive figure. Especially winning was his lack of fastidiousness which as it became clear to me subsequently derived from the unquestioned nature of authority and the resulting self-assurance. A private conversation with Kautsky, however, yielded very little. His turn of mind was awkward, dry, unresourceful and un-psychological, his criticism schematic and his jokes banal. And for these reasons Kautsky was extremely weak as an orator. In Russia the revolution was repulsed, the proletariat thrust back and socialism was fragmented and driven underground; the liberal bourgeoisie sought a reconciliation with the monarchy on the basis of an imperialist programme. Disillusion with the methods of revolution rolled over the International like a wave. Opportunism took its revenge. As the international relations of the capitalist countries grew tenser the denouement drew closer and the socialist parties were compelled to define their position: for the national state or against it?—it was necessary either to draw a conclusion from revolutionary theory or to carry opportunist practice through to the end. Meanwhile Kautsky’s whole authority rested upon the reconciliation of opportunism in politics with Marxism in theory. The left wing (Luxemburg and others) demanded straight answers. The whole situation demanded them. On the other hand the reformists went over to the offensive along the whole front. Kautsky became more and more confused, fought the left flank more and more doggedly and came closer to the Bernsteinites while vainly trying to preserve the semblance of a Marxist position. During this period even his appearance changed: the clear tranquillity disappeared, his eyes would shift around with alarm and something was pitilessly gnawing at him inside. When the German revolution broke out Kautsky became something of an ambassador of the bourgeois republic and preached a break from Soviet Russia (“it doesn’t matter as it will fall within a few weeks”) and working out Marxism in a quaker direction crawled off to Wilson on all fours. How savagely history’s dialectic has dealt with one of its own apostles.